Ditch the fancy molds when making Christmas Tree JIGGLERS! 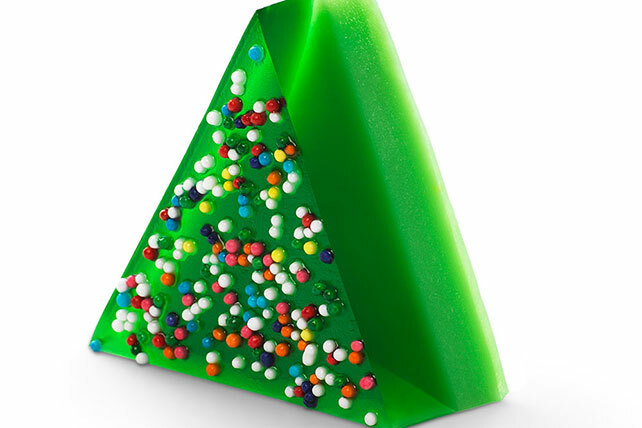 All you need to make Christmas Trees JIGGLERS are four ingredients, one square pan and a knife. Add 1-1/3 cups boiling water to 2 pkg. gelatin mixes in medium bowl; stir 2 min. until completely dissolved. Pour into 8-inch-square dish sprayed with cooking spray. Refrigerate 25 to 30 min. or until gelatin is set but not firm. Meanwhile, add remaining boiling water to remaining gelatin mixes in medium bowl; stir 2 min. until completely dissolved. Stir in evaporated milk. Refrigerate 15 min. or until slightly thickened; pour over gelatin layer in dish. Refrigerate 4 hours or until firm. Unmold onto cutting board just before serving; cut into 4 rows, then cut each row into 7 alternating triangles. Garnish with sprinkles. Reserve gelatin trimmings for snacking. Save 40 calories and 11g of carbs, including 11g of sugar, per serving by preparing with 4 pkg. (0.3 oz. each) JELL-O Lime Flavor Sugar Free Gelatin. For children under 6 years of age, cut JIGGLERS into small bite-size pieces. Children should always be seated and supervised while eating. For more information, visit www.KraftKidsSafe.com. Gelatin can be refrigerated overnight before cutting into JIGGLERS and decorating with sprinkles as directed. To unmold chilled gelatin, dip dish in warm water, just to rim, for 15 sec. Lift dish from water; gently pull gelatin from edges of dish with moistened fingers. Place moistened plate on top of dish. Invert dish and plate, then shake to loosen gelatin. Gently remove dish. If gelatin still sticks to dish, place in warm water for another 5 sec. before unmolding gelatin and cutting into JIGGLERS.